Known among those with an affection for both teams as 'The Blues Brothers,' the history between the two clubs can be traced right to the formation of Chelsea FC, back in the early 20th Century, in 1905. Their paths have crossed more than once in the intervening 109 years, however never in a competitive match. Indeed, Chelsea's first manager and scorer of their first ever competitive goal played a huge part in Rangers success in the early 1900s, Jacky Robertson. A Dumbarton man, who started his playing career with Morton before heading to Everton, he was signed from Southampton in 1899. One of an 'exceptional group of players' signed in the aftermath of Rangers becoming a Ltd Company in May 1899, he is described in Rangers: The Complete Record as 'considered to be one of the finest players in the history of the Scottish game. The outstanding left-half of his time, a player of power, of attacking instincts and deadly finish with an exceptional heading ability.' Praise indeed! He captained Scotland's great team of 1900, which beat England 4-1 at Celtic Park and was signed for the princely sum of £300. In total, Jacky played 130 times for Rangers scoring 25 goals, from 1899-1905, amassing 16 Scottish caps. He was part of three Championship winning Rangers teams: 1899/1900, 1900/1901 and 1901/02–Three In a Row! I'm sure you'll agree, John Tait Robertson made a significant contribution to the Rangers teams of his time. His last game for Rangers came in a League Title Play-Off v Celtic, at Hampden Park on 6th May 1905. Jacky scored in a 2-1 defeat which saw the title head to the East End for the 5th time. But at the age of 28, the Dumbarton lad left Rangers to return South, and to a new club that had been formed in the Rising Sun Pub, on the 10th day of March, 1905. Chelsea Football Club had a fortuitous beginning, if history is to be believed. Their founder, Henry Agustus 'Gus' Mears, along with his brother Joseph, had purchased Stamford Bridge Athletics Ground in 1896 with the intention of staging first class football matches. They failed to persuade Fulham to play their matches there over a dispute about rent and considered selling the ground to the Great Western Railway Company. But Mears's colleague Fred Parker had been trying to dissuade him from selling and to start his own football club, with little success when, on a 'whim' after Parker had been bitten by Mears's dog when walking around the Stamford Bridge ground, Mears said to him, "Go to the chemist and get that bite seen to and meet me here at nine tomorrow and we'll get busy!" This new team needed a leader. Step up former Morton, Everton, Southampton, Rangers and Scotland half-back Jacky Robertson. He was hired by Chelsea as Player/Secretary/Manager and was charged with building a new team. 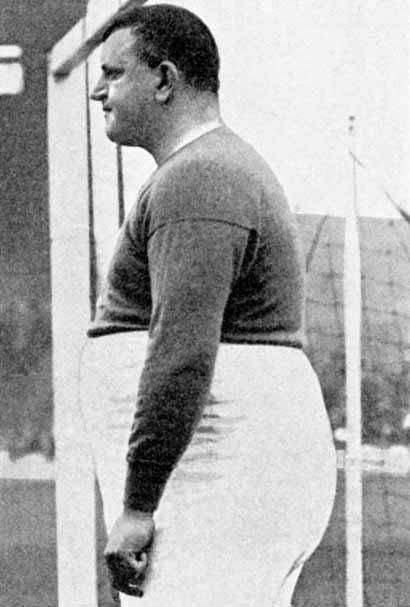 Among his first signings were William 'Fatty' Foulke, a 22st goalkeeper (and aptly named as the picture proves) and later George 'Gatling Gun' Hilsdon who would become the club's first 100 goal striker. That first Chelsea team also included another player signed from Rangers, Charles Donaghy. Born in India, he played 8 games for Rangers, scoring 3 goals before signing for Chelsea in their inaugural year. Jacky Roberston standing next to Gus Mears, far left of picture. 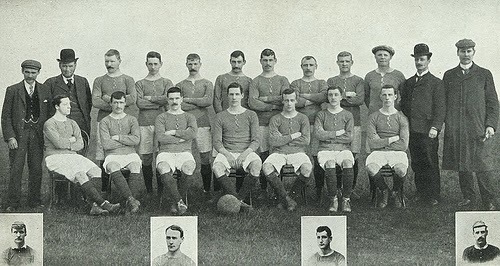 Chelsea's first ever squad. Middle Row, 2nd from left is the other Rangers signing Charles Donaghy. Not content with going down in the history books as Chelsea's first manager Robertson also scored their first goal in a competitive match. This came against Blackpool on 9th September 1905 in a 2nd Division clash. In their first season, he led them to a respectable 3rd place in the 2nd Division and was expected to lead them into their second season with high hopes. However, in a tale that doesn't seem out of place 108 years later, Jacky resigned on the 27th November 1906 due to his position being 'progressively undermined by boardroom interference', having lost the power to select the starting eleven. A prophetic tale, perhaps? In all, he played 36 games for Chelsea, scoring 7 goals and posted 30 wins, 10 draws and 10 losses in his 50 games at the helm, his teams scoring 121 goals and allowing only 54. But Jacky Robertson's tale doesn't end there. After Chelsea he joined Glossop, a 2nd Division side at the time from the Derbyshire area, as player manager where he remained for two years when he became Reserve Team coach at Manchester United. Of course the history between Rangers and Chelsea doesn't start and end with Jacky Robertson. The first time the two clubs met on the field of play was on 16th May 1954, in Montreal, Quebec, with Rangers emerging victorious 1-0. Both teams were on a tour of North America, and would play each other twice more, on the 5th & 6th June 1954, in Toronto and New York respectively. Chelsea won 4-1 on the 5th and the last game on the 6th was a 0-0 draw. The clubs have met 5 times since, all friendlies' and most notably a charity match in aid of the Bradford City Disaster Fund, which was played at Stamford Bridge on 16th May, 1985. Chelsea won that match 3-2, would you believe that Duncan Shearer – yes, THAT Duncan Shearer who once played for Aberdeen – scored for Chelsea in that match! There have been numerous players throughout the years who have swapped the blue of Rangers for the blue of Chelsea and vice versa. Laudrup, John Spencer, Nigel Spackman, Ray Wilkins, Graham Roberts, Derek Johnstone and doubtless others. Gordon Durie remains one of the Chelsea players to have scored the most league goals in one match, five against Walsall in the 2nd Division, 4 Feb 1989, and Tore Andre Flo remains the 5th highest Transfer Fee ever received by Chelsea, equal with Sturridge and behind Zhirkov to Anzhi (£13.2m), Kevin de Bruyne to Wolfsburg (£17m), Robben to Madrid (£24m) and Juan Mata to Manchester Utd (£37.1m). Not a pleasant thought for us Rangers fans considering our current predicament. It's been 29 years since Rangers last visited Stamford Bridge, we must be due down there soon for a Blues Brothers' Revival. Lets Keep The Blue Flag Flying High!